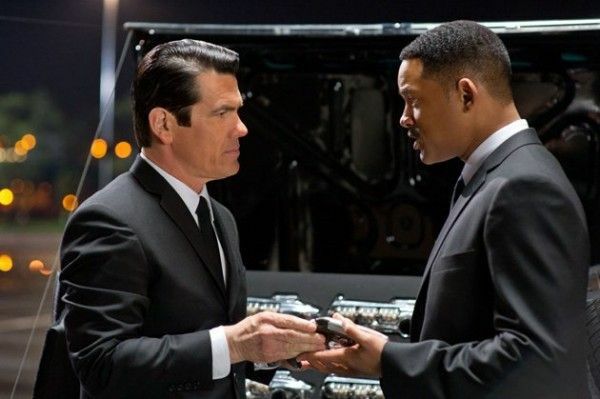 A new trailer for Men in Black 3 has gone online. There aren’t may laughs to be had, but there are the same Men in Black gags: “Weird-looking people are aliens!” “Our mission involved something gooey and gross!” “We’ve got cool toys (even if one of the new vehicles looks a lot like ‘The Entity” from South Park)!” Josh Brolin‘s Tommy Lee Jones impression is still spot-on, but I don’t know if that’s enough to carry a movie where someone uses the word “shiznit”. The plot warps Agent J (Will Smith) back to the 1960s, but I got a severe case of 90s déjà-vu watching this trailer. Hit the jump to check out the trailer. The film also stars The film also stars Emma Thompson, Jemaine Clement, Alice Eve, and Nicole Scherzinger. Men in Black 3 opens in 3D on May 25th.